This week, the St. Paul Pioneer Press featured a story by Frederick Melo, who reported on a study by the University of Minnesota (UMN) Law School concerning gentrification in the Twin Cities. The article, “In Twin Cities, gentrification not really hurting the poor, UMN study says,” summarizes the study and then gathers comments from local experts. The contrast between the conclusions in the study and the reactions of the participants may reveal more about the politics of the Twin Cities than the reality of the situation. Once again, the specter of gentrification has been raised in the Twin Cities. Spurred in part by local and federal interest in exploring new approaches to fair housing and economic development, a chorus of local politicians, commentators and activists have emerged to warn that the region’s community development system is a necessary bulwark against ongoing gentrification. It is interesting to note that the Institute on Metropolitan Development (IMD) at UMN Law School has as a mission to focus on the needs of “distressed” suburban communities within the metropolitan area. Myron Orfield, director of IMD, amplified his policy concerns in the Pioneer Press article, which says that Orfield “believes too much affordable housing is concentrated in poor, high-minority neighborhoods and not enough is being built in higher-end neighborhoods.” This is a pretty clear statement of support for deconcentration of low-income households into more affluent areas, along the lines of the new Affirmatively Furthering Fair Housing regulations promulgated by the Obama administration. Mr. Melo’s article continues with some perspectives from local community development practitioners. They slice and dice the report findings according to their own perspectives without ever offering a clear rebuttal. For example, the two directors of neighborhood development corporations lamented the lack of affordable housing development in their local communities without directly challenging the report findings. St. Paul’s planning director Jonathan Sage-Martinson told Mr. Melo, “Middle-income renters of all backgrounds are feeling the pressure.” But he didn’t want to be cast as one of those who are waving the “gentrification” flag: “‘As a whole, I’m not really worried about gentrification,’ he said. ‘I’m worried about involuntary displacement—folks being displaced because their incomes aren’t going up as fast as housing costs.’” This seems like a distinction without a difference. Beyond these disputes between the policy advocates at UMN and the local program managers, there were thoughtful citizen comments posted to the E-democracy Forum. which show a wide diversity of opinion from ordinary folks. Bill Cooley, for example, suggests that locating low income housing in the suburbs won’t work because of increased travel costs (like buying a car) and a “cultural disconnect” between low-income minority households in predominantly white suburbs. 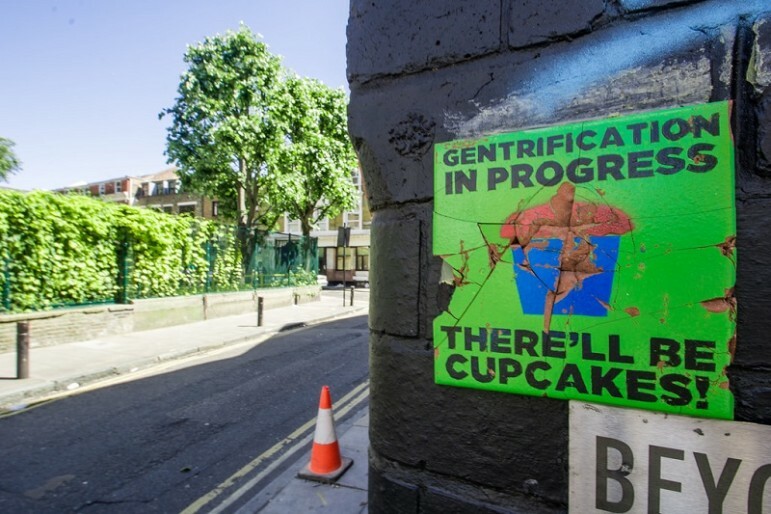 Sheldon Mains suggests that a metropolitan view of gentrification misses the intensely local nature of the problem of involuntary displacement. “The large size of the study areas will mask any gentrification that is happening,” he says, and offers some examples.